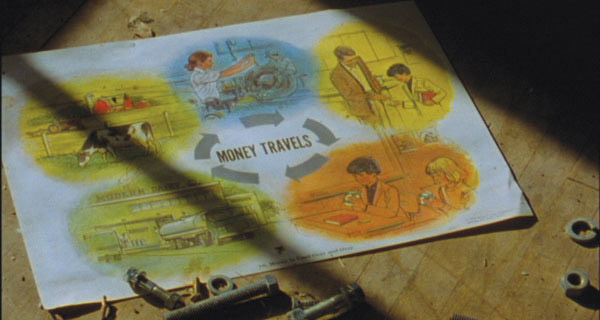 Lee Anne Schmitt, California Company Town, 2008, still from a color film in 16 mm, 76 min. LAST YEAR, the CIA reported that if California were to become an independent state, it would have the tenth-largest economy in the world. Despite the state’s steady rise as an important center of production, there still exist a number of severely depressed and abandoned towns scattered just outside the county lines of California’s largest metropolitan areas. These sites—former boomtowns established around specific industries and occupied by laborers—are the subject of Lee Anne Schmitt’s haunting new film, California Company Town. Since 2003, Schmitt has been researching, visiting, and filming these outlying areas, which are depicted in the film with a quiet restraint that to some may seem like indifference. Shot on 16-mm film, the twenty-odd towns that Schmitt profiles appear as they really are—as vacant buildings, abandoned graveyards, warning signs, and tourist spectacles; as spaces where marginal inhabitants move under the muted blue-gray of polluted skies. As the film progresses, one town becomes nearly indistinguishable from the next. Accompanied by Schmitt’s earnest narration, these images quickly become an essay on privatized land ownership, the failure of cooperative labor, the effects of industrial fallout on the environment, and, underlying it all, the American dream. Recounting facts and using archival film and audio, the artist cautiously fleshes out short, contained narratives to hang on the bones of each town; the Japanese internment camp of Manzanar, for example, is brought back to life with propagandistic film clips created by the US War Relocation Agency (footage that has also been employed by video artists Bruce and Norman Yonemoto). The desolate streets of Eagle Mountain are set to a requiem that, we are told, is a recording of the last student concert held in the town. In Keene, we catch glimpses of scattered ephemera at the abandoned United Farm Workers headquarters while a Cesar Chavez speech plays briefly on the sound track. Schmitt’s strength as a filmmaker is precisely this balance between composed documentation and efficient storytelling. While each shot moves at a steady, somewhat eerie pace, each company (be it McCloud Lumber, Standard Oil, or the United States government) is rendered through uncomplicated testimony. The effect of this rationalist drift through a facet of twentieth-century economics is powerful. California Company Town receives its world premiere on September 22 at REDCAT in Los Angeles. For more information, click here.